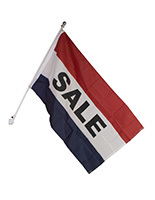 Can your business benefit from stock message flags offered for sale here? 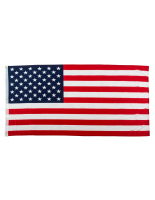 These iconic tri-color red, white, and blue banners come with a variety of words and phrases, as well as classic patriotic USA flags with stars and bars. 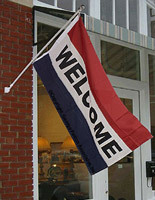 We have complied all of our horizontal stripe advertising flags and grouped them in this category for easy shopping. 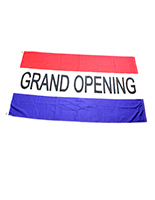 These outdoor message flags for sale feature bold pre-printed text advertising OPEN, SALE, WELCOME, NOW RENTING, OPEN HOUSE and more. 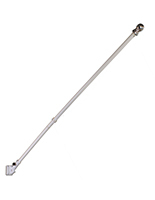 These advertising banners are offered as standalone units, and many also come paired with a flagpole and flag-mounting bracket as ready to use kits. 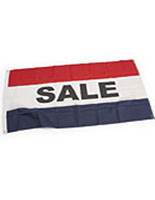 These stock message flags for sale, also known as 3x5 advertising banners for outdoor display, are commonly seen outside store fronts, retail establishments, local businesses, and apartment complexes. The 3' x 5' banner flag size and style is designed for maximum streetside visibility in public areas. Where are these accessories most commonly displayed? 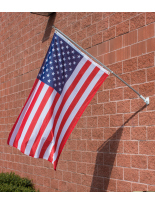 Stiped red, white & blue 3' x 5' nylon message flags are often seen street side outside local businesses and organizations. Barber shops, beauty salons, banks, cafes, retail locations, and real estate agencies are just a few of the many locations where outdoor OPEN banners are used. 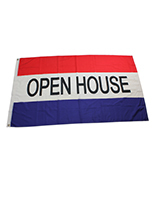 Stock Real Estate industry messages such as "NOW RENTING" and "OPEN HOUSE" allow these 3x5 flags to be used in rental complexes or outside homes, businesses, or property for sale. 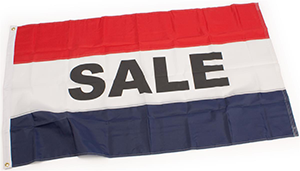 Pre-printed flags with stock messaging are designed to be used by a wide selection of industries and businesses. Whether you need a single banner, a replacement mount and post, or a complete ready-to-use OPEN messaging flag kit, AdvertisingBannerFlags.com will have the selection for your business' display marketing needs. 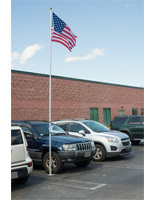 Unlike oversize signs and banners, these smaller 3x5 flags can easily be taken in every night at the end of the business day. These red, white and blue striped accessories have three bold color block stripes with the stock messages printed in bold black lettering. 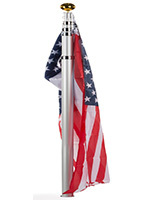 Advertising flags for small businesses come with a wide variety different pre-printed messaging to accommodate the needs of many different industries. All of our durable pre-printed outdoor banners are made of 100% nylon fabric for maximum color retention and protection from sun damage. These nylon advertising accessories also stand up well in the rain and snow and are adorned with bold blocks of bright colors to grab the attention of customers passing by. Shop our full selection of stock and custom messaging displays to find the perfect match for any business outdoor or trade show display advertising.